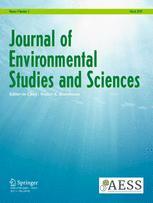 The Journal of Environmental Studies and Sciences offers a venue where relevant interdisciplinary research, practice and public policies can be recognized and evaluated. Increasingly, environmental studies integrate many different scientific and professional disciplines. Thus the journal seeks to set a rigorous, credible standard for specifically interdisciplinary environmental research.